I lived in Bay Ridge, Brooklyn until age 35 and took a lot of bus rides to surrounding neighborhoods, with parents and then, after turning 17, without. (Just kidding. I was biking around the borough as early as age 10). One of the favored routes was the B16, which went from Shore Road to Prospect Park and stopped across the street from my home. 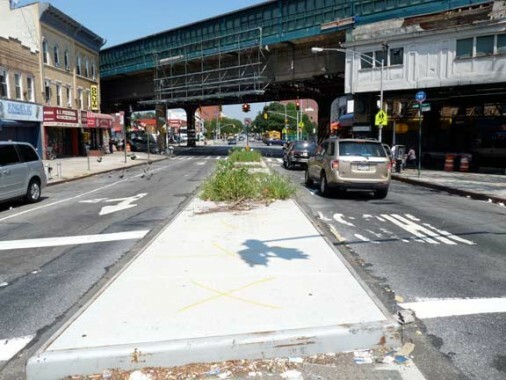 Between 1959 and 1964, the entire south side of Fort Hamilton Parkway, the roadway the B16 traveled on, was destroyed to make way for the Gowanus Expressway. Robert Moses and his surveyors spared my apartment building, but barely. The odd thing was that the demolitions began in 1960 and you had block after empty block for a couple of years before the actual excavations began. The construction of the Verrazano Bridge, and the expressway that was its approach ramp, was well-chronicled by my father, a camera and tape recording buff (Unfortunately my Verrazano Narrows Bridge page has not yet been moved to WordPress, but here’s the Classic edition). 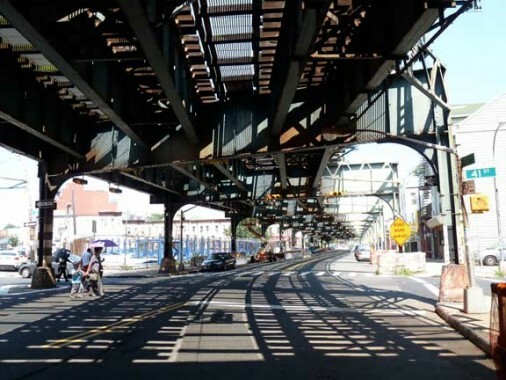 The B16 went through Borough Park, a vast grid of streets between Bay Ridge and Prospect Park. 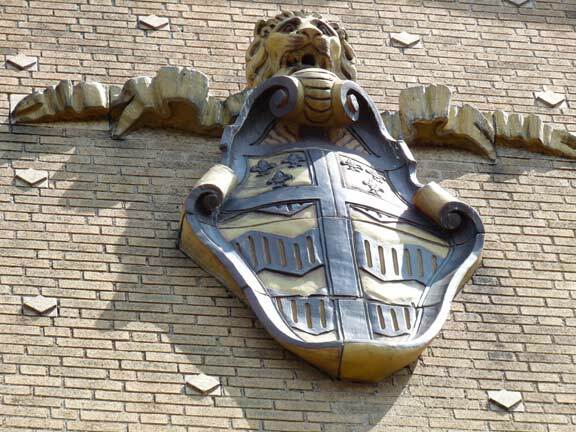 Until age 8 or so, I would make sure to grab a seat by the window, taking what would be on my personal coat of arms if I ever created one: a pencil, spoon, and one of those tiny light bulbs that comes in flashlights. My father would let me use the burnt out ones. With those, I would imitate, or build miniatures of, the various lampposts that the bus passed by, and when I got home, I would fill tablets with renderings of what I had seen. I remember what poles were where before they were all replaced in a great modernizing purge around 1962 or 1963, and after the poles were changed to more or less standard octagonal poles, I can still tell you which ones carried the GE M-400 lamps and which ones carried my favorites (because they were a little rarer) the Westinghouse Silverliners. The two makes battled for supremacy on NYC streets between 1960 and about 1972, when brighter soldium vapor lamps took over. (No, I will not detail what poles carried which). I can even describe for you the strange lamp masts that were on telephone poles before the purge occurred — there were a number of different styles. After about age 8, my mother suggested it wouldn’t be a good idea to keep carrying the pencil, spoon and lightbulb on public transit anymore, but I continued to fill tablets with lamp renderings into high school. I am too clumsy and fumbling to ever be a good artist, but I can still do recognizable facsimiles of the various poles around town. The B16, though, held charms other than lamppost viewing which, after all, could be done on any bus line. The bus went past a favorite visiting spot, the apartment where my aunt Mary and her family lived. I continued to visit about once a month until I moved out of Bay Ridge. My aunt would often defeat me at Scrabble, but she was quite lucky and always got the Js and Vs. I have taken pains to not concentrate on demographics in FNY, but it’s inescapable that Borough Park is mostly Orthodox Jewish with a large concentration of Hasidim, with the iconic dress of black coats, fur hats, prayer shawls, long sleeved dresses for the women, with sidelocked boys, and signs featuring Hebrew characters. You would think my aunt’s Irish Catholic family would have been isolated in Borough Park, but my Aunt and late Uncle Jim were garrulous sorts, and had as many friends among the Orthodox as they had with the Irish and Italian Catholics that also dotted (sparsely) the landscape. The B16 was also the route to House of Horrors, ie. Dr. Levine’s office on 49th Street, where I would be poked, prodded, and shot with all manner of needles. I was a sickly child, and visits were frequent, until my teens when I changed to my father’s doctor, whose office was two blocks away from me. For the most part, though, the B16 held other attractions for me. 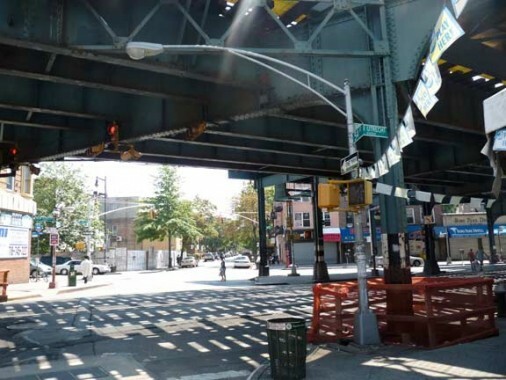 We would ride sometimes only as far as 37th Street, to watch the bocce matches that happened under the Culver shuttle elevated line on a mostly unused section of South Brooklyn railroad track. 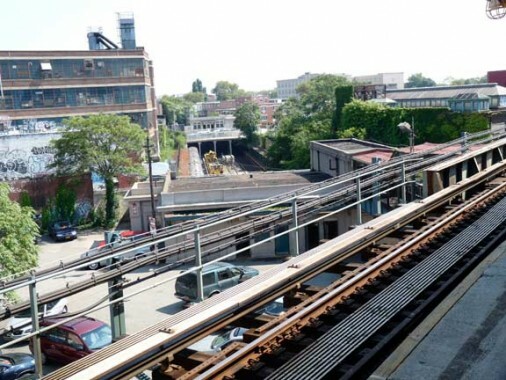 (The Culver ended service in 1975, and the el was finally torn down 10 years later — the city was completely broke in the Super 70s and could not afford to raze the subway and el lines that had been put out of service). Most times, though, the ride ended a block from Prospect Park, and we were usually good for an hour’s walk. If it was super cold, though, a parent would just re-pay the fare, and we’d ride back. And, it was again an opportunity for discovery since this time I was seeing the other side of the streets! To make a long story short, Borough Park had its beginnings in a small hamlet called Blythebourne, an area of cottages built by developer Electus Litchfield in 1887. 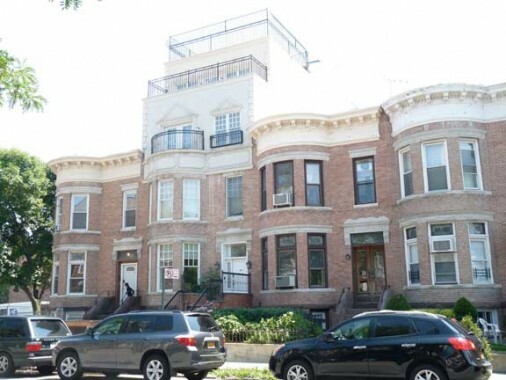 A short time thereafter another developer, William Reynolds, built more speculative housing in the area, which was served by the Brooklyn, Bath and Coney Island West End Line steam railroad, which had been developed by future Mayor C. Godfrey Gunther in the 1860s. The line began at Green-Wood Cemetery and ran through were mostly farms and fields to the wealthy seaside resorts at Coney Island, long before it became The People’s Riviera. As early as 1904-1905, Jews from eastern Europe were immigrating to Borough Park, and various European persecutions over the years added to their number. The Sea Beach Railroad, named for the Sea Beach Palace Hotel which was its terminal beginning in 1879, also cut through the region (it and the West End met at Bath Junction, q.v. below, at 14th Avenue and 62nd Street. The Sea Beach, originally a steam line, was electrified and placed in an open cut as part of the Brooklyn Rapid Transit/IRT Dual Contracts program in 1913, and it is this line I used to arrive today in Borough Park. The terms “Brooklyn-Manhattan Transit” and “Sea Beach” have long passed out of the vernacular, but they’re still remembered by subway foam_, er, ah, buffs, like your webmaster. Residents simply call it the N train. 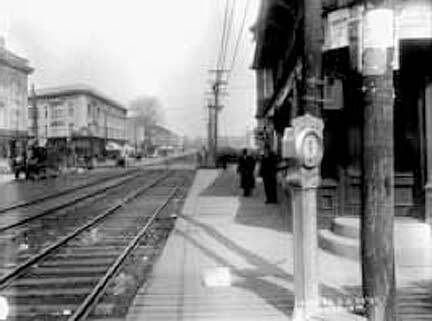 Later, the West End was placed on an elevated line over New Utrecht Avenue in 1917. 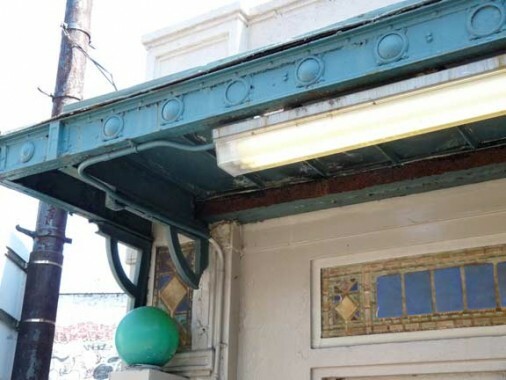 As you can see, handsome station buildings were placed at stops along the line, with tiled interiors, hanging incandescent lamps, and distinctive terra cotta tilework with a diamond motif. After a period of deterioration in the 1960s and 1970s these stations are again regularly maintained. 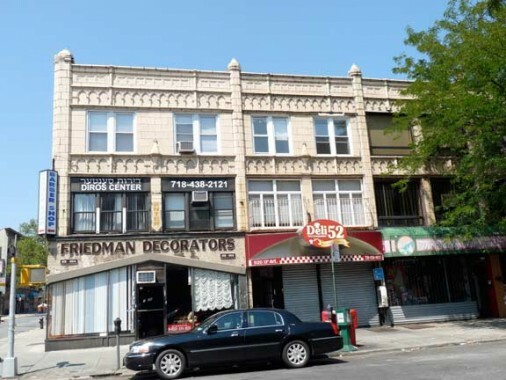 I will be showing a couple of Borough Park’s beautiful synagogues on this page, but showing the cream of the crop will be done on a future page. This one stands at 11th Avenue and 56th Street. There are freestanding buildings in classic styles, and some in private homes. When I see Hebrew characters on a storefront or sign, not speaking either language, I never know if it’s in the Hebrew language or in Yiddish. Which one is this, on 53rd Street? 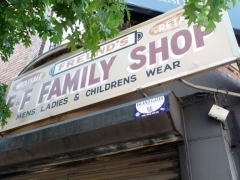 There has been a lot of noise about forcing Asian shopkeepers in Flushing and Sunset Park to include American translations in their signage, but non-Hebrew speakers in the area seem to have no problems with these signs. This is one of those private residence synagogues I was referring to, in a handsome, dormered brick building on 12th Avenue and 53rd Street. 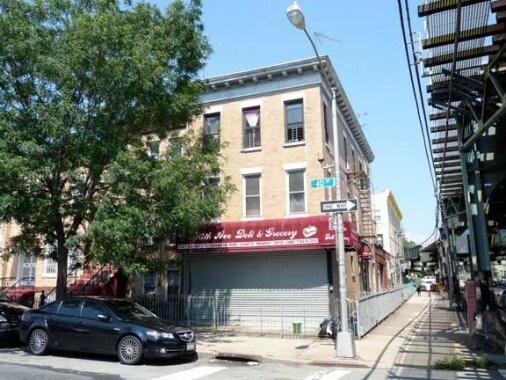 In the 2000s Borough Park enjoyed a population boom, and the attached brick buildings of the early 20th Century were torn down in favor of multifamily structures, or, in this case, out of character additions on 12th Avenue. These attached bayed residences on 54th Street remain gloriously unaltered except for bars on the ground floor windows. Even the original roof corbelling is still in place. 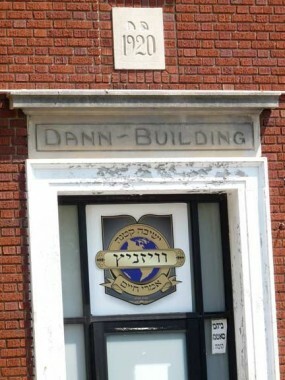 The Dann Building, 54th and New Utrecht Avenue, is handsome but somewhat nondescript except for some exquisite lettering over the door. The font reminds me of the unique one used on Dannon Yogurt labels, with ovoid shapes and curved ascenders and stems. I’m sure the connection is coincidental, as the yogurt brand was first developed in Spain and is now based in France. The date of construction is helpfully chiseled above the entrance. 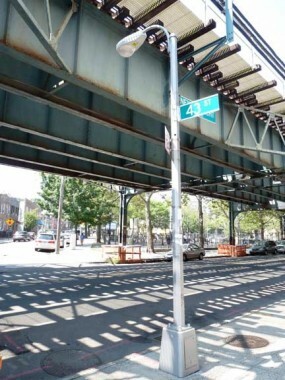 I’ve always been partial to this dwarf double-mast lamppost at New Utrecht Avenue and 54th Street. I headed off down 13th Avenue which, in proximity to the West End El, is festooned with magnificent Beuax-Arts architecture like this apartment/storefronts on 53rd Street. This is close to the original settlement at Blythebourne, and was developed a little earlier. 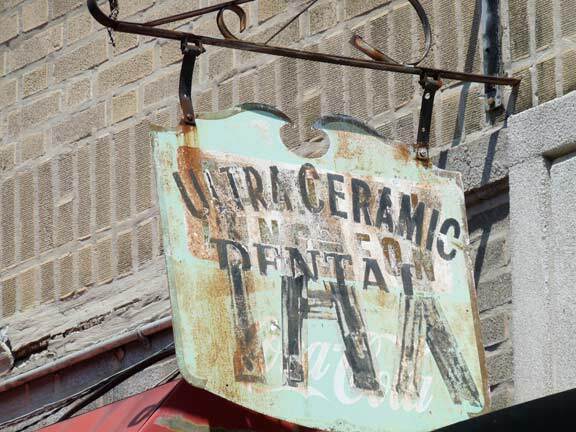 Click on the above Gallery to see some of 13th Avenue’s hand-lettered building signs. 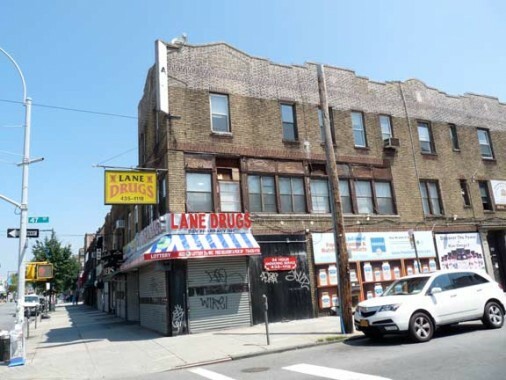 This is one thoroughfare without a single McDonald’s (the closest is at Fort Hamilton Parkway and 37th Street) or Starbucks, as the avenue is dominated by locally-owned mom and pop shops. 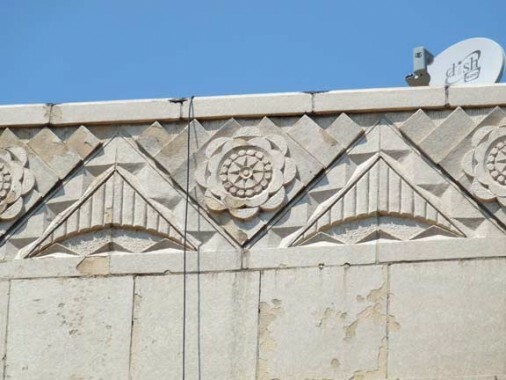 This building, at 12th and 52nd, came along a bit later, as we see the repeated motifs in stone and terra cotta that mark Art Deco, a style originating in the mid-1920s and dominant till the outset of World War II. 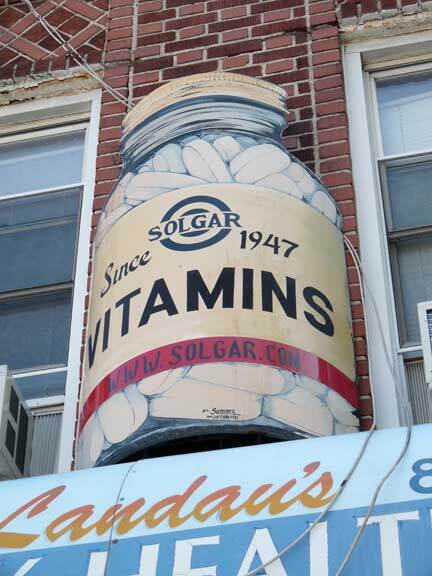 On the opposite side of 13th at 52nd (or 53rd) there was a long-time drugstore called Heyman’s Pharmacy. I have a bizarre memory of the store because an interior painting reminded this Catholic boy of a story I had heard of the flaying of St. Bartholomew. Looking back on it now, I’m sure a Jewish drugstore would not depict a scene in which a man was tortured and martyred by having his skin cut off, but immersed in Catholic lore as I was, that’s what the picture looked like to me. 13th Avenue and 52nd, northeast corner. 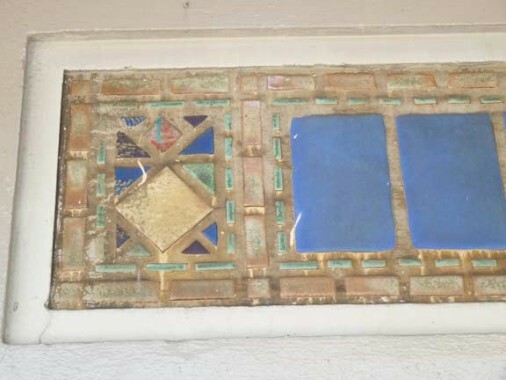 These terra cotta exteriors are typical of storefront/apartment strips built in the 1920s. The Borough Park Club at 13th Avenue and 50th Streets, shown here in 1905 or so, was purchased in the mid-20th Century by Yeshiva Etz Chaim, which completely renovated the building, removing the circular porch and building two-story wings in both sides of the peaked roof in the center. The grassy lawn was replaced by concrete and an iron fence. (That is the academy here I remember from my youth). That structure, in turn, was razed in the 1980s and replaced by Salomon Plaza, a nondsecript row of stores. 1303 50th Street. My aunt Mary has lived in this building for 55 years and is finally moving out to live with cousin Michel at age 86. 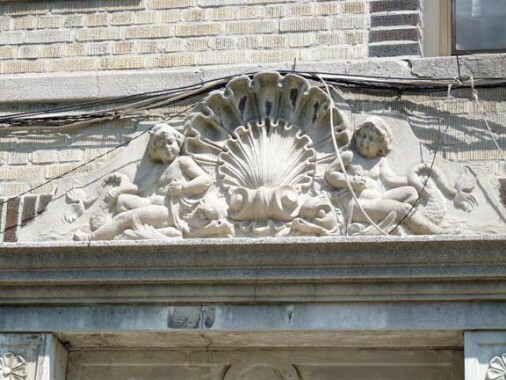 This looks like a relatively unostentatious structure until you look over the door, where you see a Beaux Arts touch: two cherubs, two stylized dolphins and a central seashell. Perhaps the builder had a maritime connection. I was sorry to see that grand old Crown Caterers neon sign between 49th and 50th was replaced by something more contemporary. Two (JP Morgan) Chase branches took over other bank buildings just a block apart, at 48th and 49th. 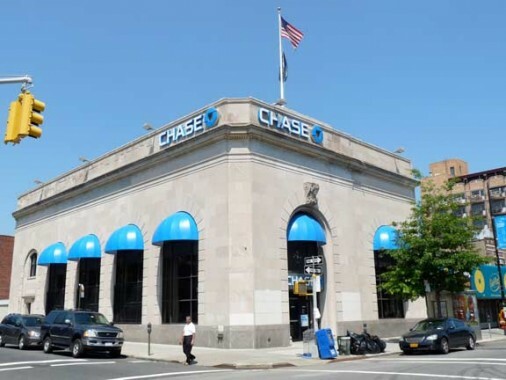 Why the neighborhood had a need for two Chase branches so close together, I’m stumped, though they may offer different services, or “products” as banks now like to say in promotional literature. Another monstrous addition, in addition to what was shown earlier. However, Bloomberg’s plan is 9 million by 2030 or bust. We’ll just have to accept this sort of stuff. My cousin Eileen worked behind the counter at Lane drugs in her teens in the Super 70s, and it’s still there at the northeast corner of 47th and 13th. 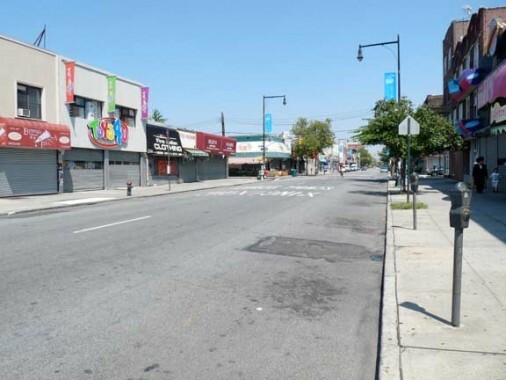 With no moving vehicles in sight, 13th Avenue on Saturday afternoon is among the quietest busy streets in NYC. The Sabbath goes from sundown Friday to sundown Saturday. One of the few places open, NW corner 43rd, was Sing Hwa “gifts, electronics, cameras” even though the display windows showed leather goods, perfume, suitcases. 13th Avenue and 42nd Street. Another Beaux-Arts building executed with casual excellence. Turning onto 40th Street, this is the no nonsense side entrance to the Works Progress Administration-era 13th Avenue Retail Market; a similar front was once on 13th Avenue, but it’s now been hidden under garish signage. These were a series of retail markets built during the Depression by the LaGuardia administration as a means to reduce pushcart traffic. 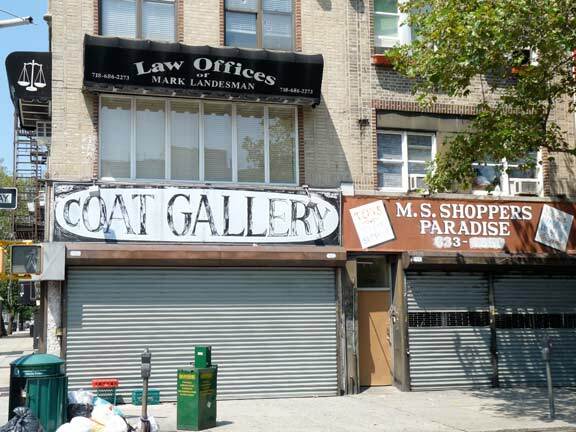 The most famed of these is likely the Essex Street Retail Market in Manhattan. 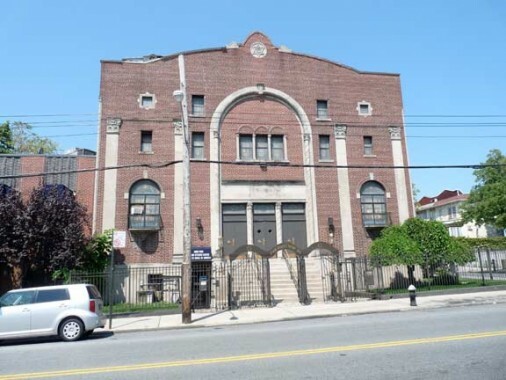 The Congregation Anshe Lubawitz of Borough Park was built in 1902 as Congregation Beth El, which moved to 15th Avenue in 1920. 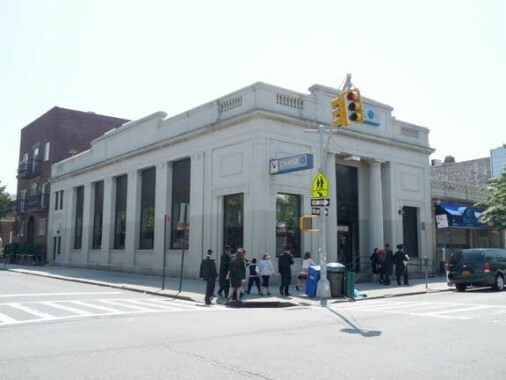 It’s the oldest synagogue building in Borough Park, though the portico with Doric columns was a later addition. 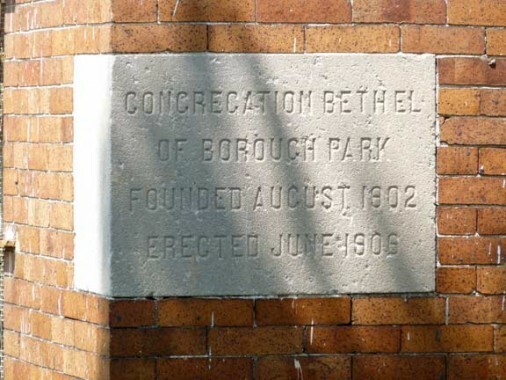 The years 190o-1905 were pivotal in Borough Park as so many of its landmarks were built in those fervid five years. 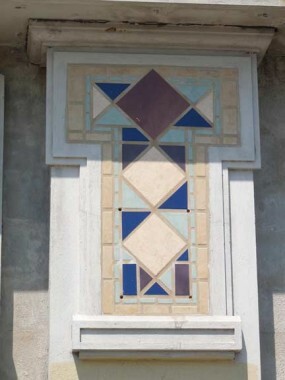 The region’s first Roman Catholic church, St. Catherine of Alexandria, had its cornerstone laid in 1902. 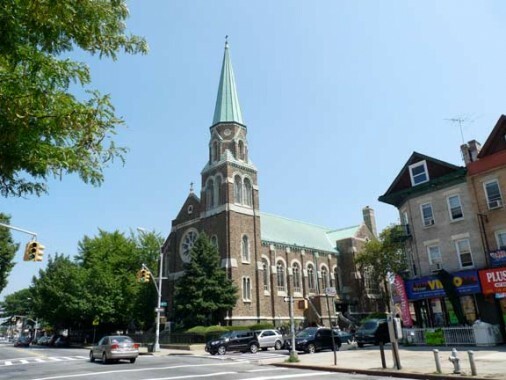 It’s the tallest tower in Borough Park and may be one of the tallest Catholic churches in the borough; I know St. Barbara in Bushwick and Regina Pacis in Bensonhurst are taller, but that’s about it. The church is located at Fort Hamilton Parkway and 41st Street. Many Catholic churches feature a number of buildings, the convent (shown above) where the parish nuns reside, and rectory where the priests live. 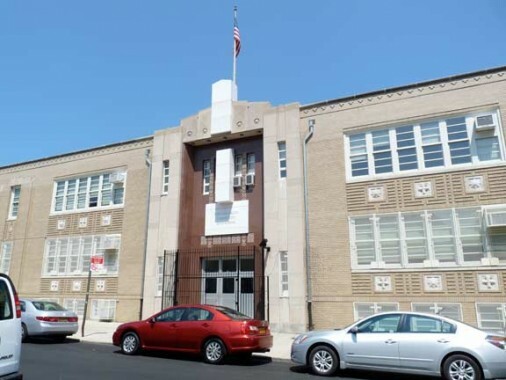 The parish grade school, constructed in 1956 on 41st Street, closed some years ago and is now the home of the West Brooklyn Community High School. 1956 was the heart of the baby boom years, and Catholics used to have more children than any other religious group — on top of that, Roman Catholicism has more followers in the USA than any other Christian group. When I attended grade school, large class sizes were the norm. 35 or more kids were packed into a classroom, and for the most part, there were passing grades. Parents were dedicated, teachers were dedicated, and most of the kids were, too. Class size was never mentioned as a hindrance to learning anything. In recent years, Catholic schools have teetered, as they seem to have priced themselves out of competition. Teacher for teacher, student for student, they are still the best places to get an education, both practically and morally. And I am talking as one kid who did not enjoy my own parochial school experience. Attaining the el at New Utrecht Avenue, I spotted this sign near 42nd Street. Of course, I was immediately reminded of this guy. 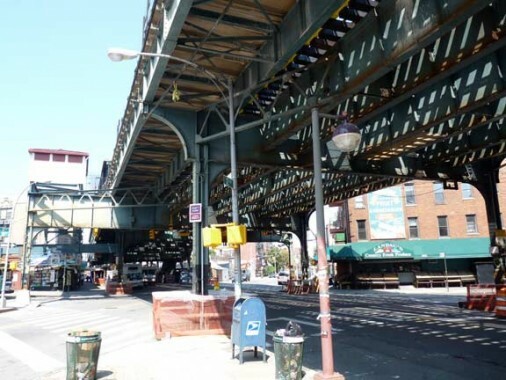 The West End Elevated runs on the 6th Avenue IND tracks in Manhattan, the BMT 4th Avenue Line tracks in Brooklyn, and the el on New utrecht Avenue, 86th Street and Stillwell Avenue to Coney Island. 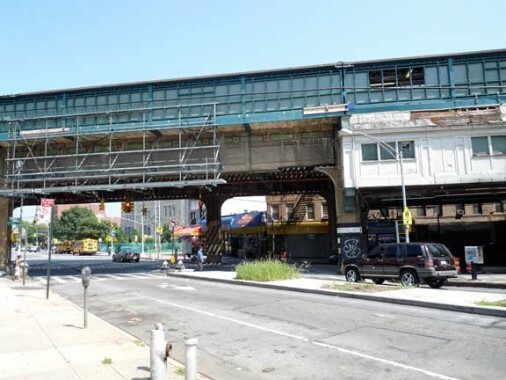 This arrangement has been possible since 1967, when a connection was made from the Manhattan Bridge to the 6th Avenue Line. 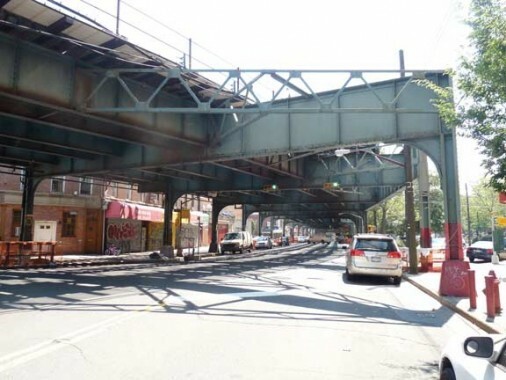 From the 1860s through 1917, the tracks ran at grade on New Utrecht Avenue, and traffic on cross streets was forced to wait for the steam trains to pass before they could go through. The Brooklyn Rapid Transit/IRT Dual Contracts, enacted in the early 1910s, allowed for new subway and el lines to be built and all grade crossings but one were eliminated. 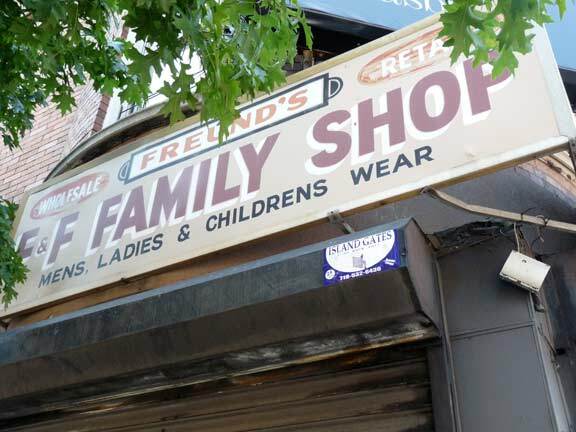 That one, at East 105th Street in Canarsie, hung in there until 1973. This scene at 10th Avenue and 40th Street is somewhat humdrum and mundane. Just a closed deli on the corner. However, a couple of years ago I passed by here, and it was the Land That time Forgot. Let me show you. 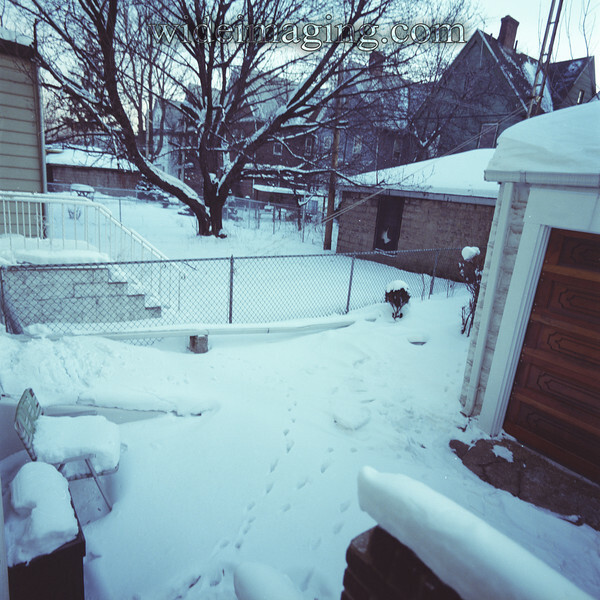 This is what the place looked like in 2008. Find out more on my ForgottenSlice about this corner. 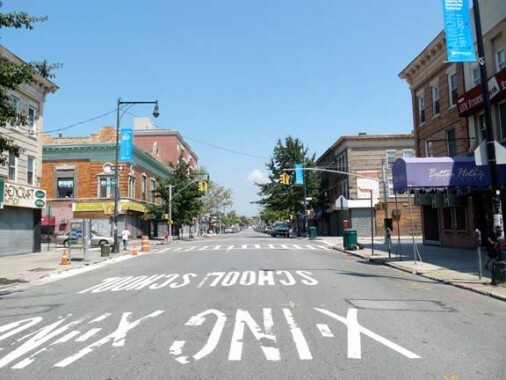 There are three blocks between 39th and 41st Streets where New Utrecht Avenue, constructed as a turnpike from Green-Wood Cemetery to Bath Beach in the mid-1800s, is vouchsafed the sunshine and is free of the elevated’s blackening grip. 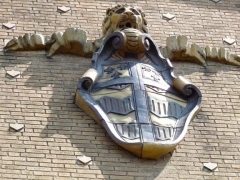 It is named for the former Kings County town of the same name, which in turn is named for the city of Utrecht (YOU-trekt) in the Netherlands. Driving south on New Utrecht Avenue, soon enough you are thrown into shadow as the el encroaches. 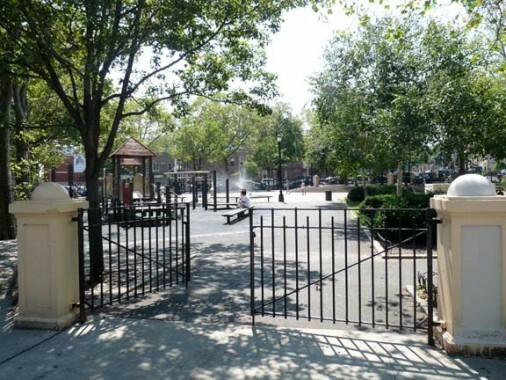 The Brizzi Playground, with its abandoned bocce pit, is at New Utrecht Avenue and 42nd Street. This photo gives you an idea of what New Utrecht Avenue looked like before the el was built above it in 1917. This scene at 49th Street was shot in 1914. Railroad tracks occupied the east side of the street with a narrow roadway on the west side. The object in front is a weighing machine, likely outside a drugstore. Your webmaster tends to stay off of scales. The tracks were used, until the 1940s with more paving surrounding them, as trolley tracks. 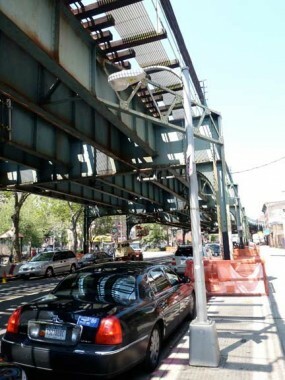 Indulge me briefly about lampposts under elevated lines. 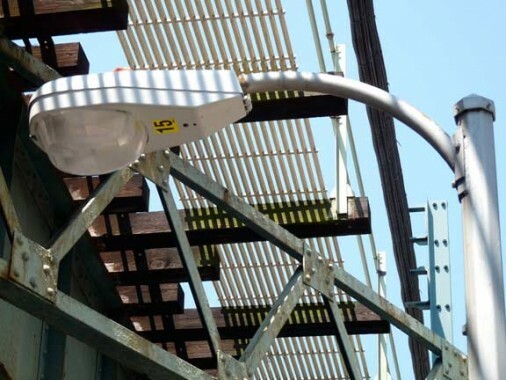 When the Department of Transportation needs to fit a shorter pole under an el structure, it sometimes employs shorter versions of its cobra neck masts, seen here. But not always. I discovered this special mastarm on New Utrecht Avenue, which must have been more frequently used in the past. It seems to be a variant of the curved mast with bracket that was the original mastarm used in the 1950s. I’ve only seen this mastarm used elsewhere in the city on White Plains Road near East Tremont Avenue — these are now rare indeed. 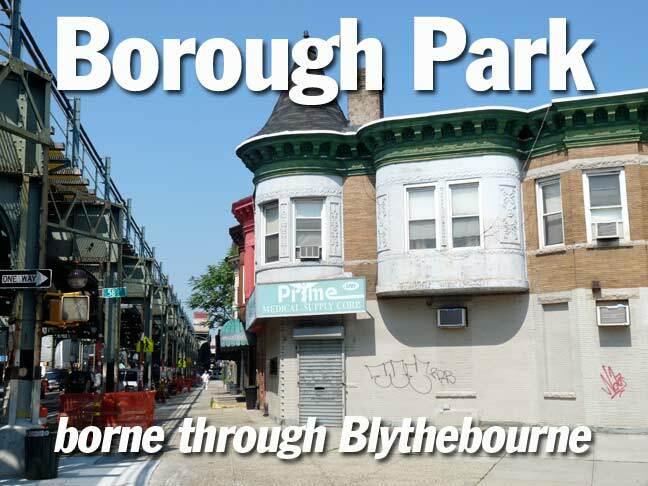 Borough Park is a giant regular grid of streets with a big “X” in the middle, where the diagonal routes, New Utrecht Avenue and Fort Hamilton Parkway, meet at 44th Street. 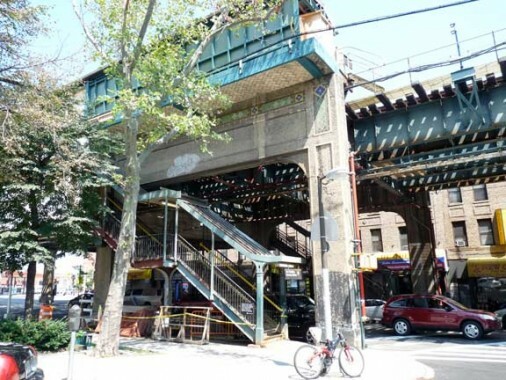 While not designated an express stop, when architect Squire Vickers was designing the el in the 1910s, he considered this a major crossing and so marked it with a concrete viaduct, decorative terra cotta, and Guastavino-style interlocking brick work. 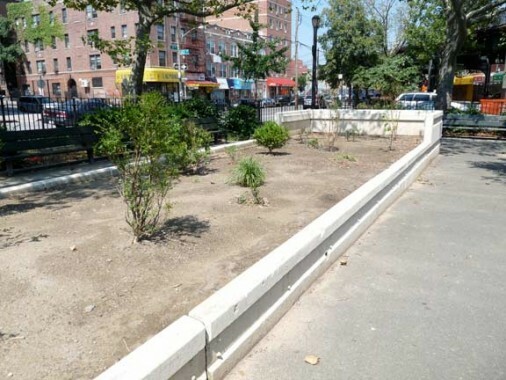 In 2009-2010 the Department of Transportation installed some center median traffic barriers, or guides, on Fort Hamilton Parkway. They have proven quite unpopular and local politicians have been trying to get them removed. Fort Hamilton Parkway appears on maps as early as the 1870s, running from Prospect Park southwest to the fort at the Narrows it was named for. It was originally an ‘Avenue” but was changed to a Parkway in the early 20th Century. 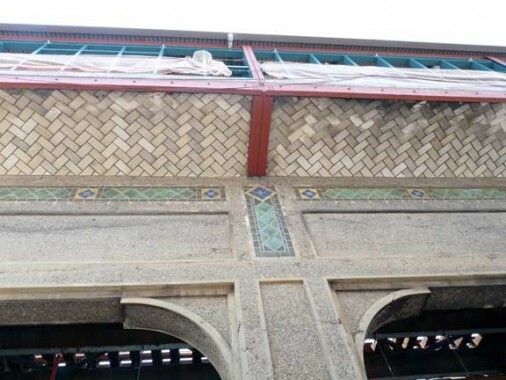 In the summer of 2011 the Fort Hamilton Parkway station was undergoing intensive repair and cleaning, which polished the diamond-motif tilework. 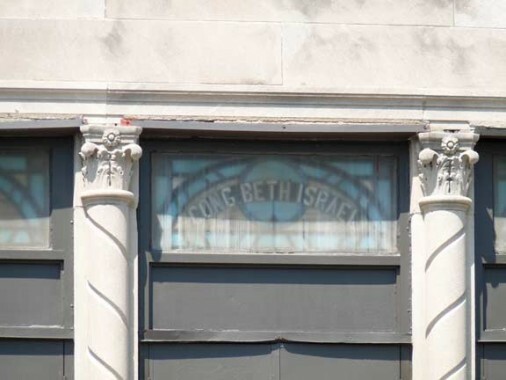 At Alben Square, New Utrecht Avenue, 11th Avenue and 45th Street, we find the 1927 Universal Theatre, later the 46th Street Theatre, and amazingly, the 46th Street Rock Palace, where major names in rock such as the Grateful Dead played in the early 1970s. Find the whole story here. 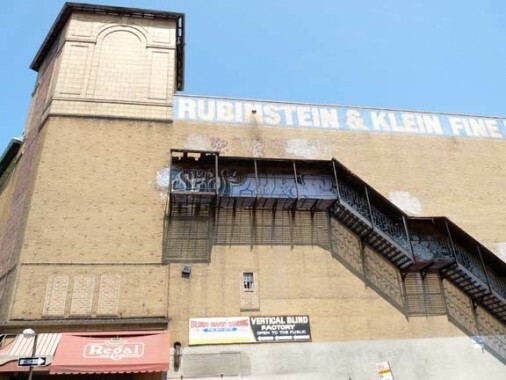 Note the Rubenstein & Klein Fine Furniture sign — we’ll see them again later. Regal Furniture now occupies the ground floor. 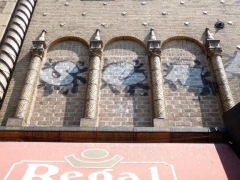 Click on images in the above Gallery for more views of the theater. 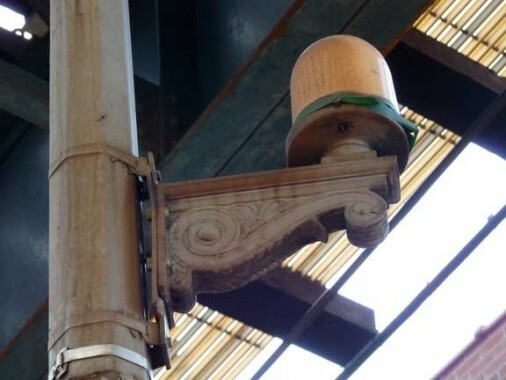 At 12th Avenue, 50th Street and New Utrecht Avenue we see one of those surviving curved mast/bracket lamps I was alluding to earlier. At right is the modern iteration of under-el street lighting. At 52nd Street we have entered Beaux-Arts territory again. Remember, these buildings went up long before the smoke and noise-belching el was in city planners’ dreams. 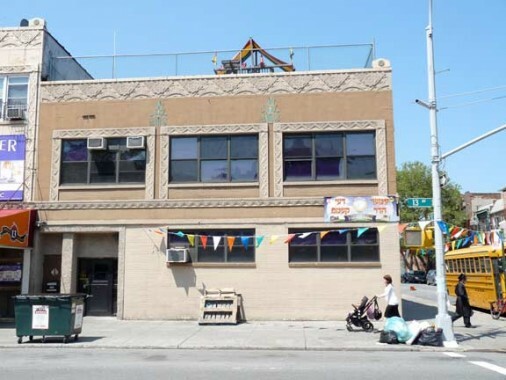 At New Utrecht Avenue and 56th Street is a ground floor kosher (adhering to Jewish dietary restrictions) diner that was actually decorated to look like an actual railroad car-style diner. 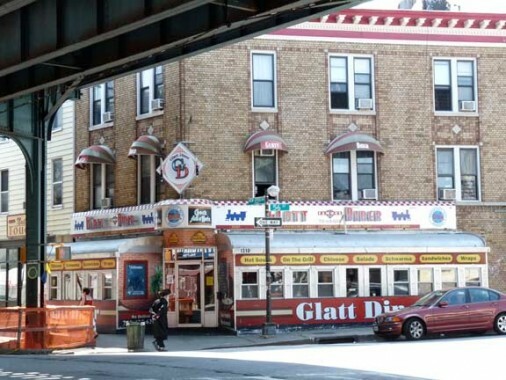 The term glatt refers to a stricter variety of kosher. The diner has been here since 1947, and the Kosher restaurant is the newest reincarnation. 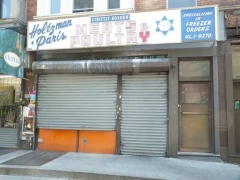 ForgottenFan Sarah Elizabeth: Glatt primarily means it’s a restaurant that serves meat (as opposed to a dairy/parve restaurant), and though it means informally that it’s stricter, there are really a ton of other, more precise terms to describe various standards of kosher. 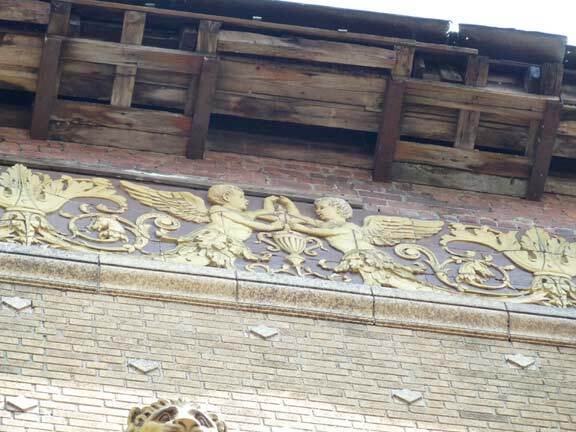 The peaked cornice marks this building at 58th Street as being from 1890-1900, when, of course, there wasn’t an el and fancier buildings appeared out in the open. 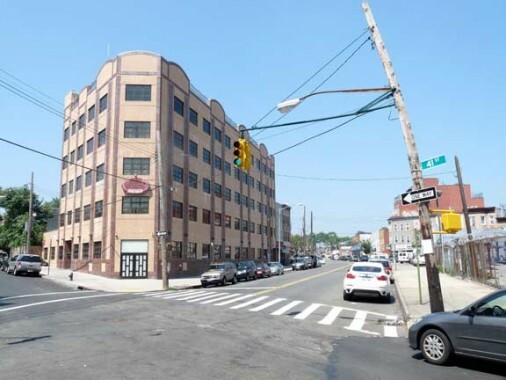 At the busy intersection of 14th Avenue, 60th Street and New Utrecht Avenue is another decommissioned Rubenstein and Klein furniture showroom. The neon sign could be seen easily from passing els. 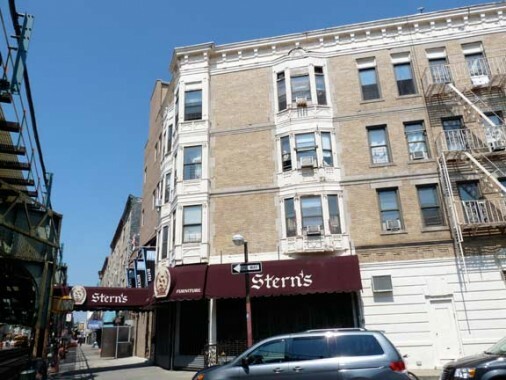 At 60th Street, Borough Park ends, and Bensonhurst, a heavily Italian but now increasingly Russian and Chinese, neighborhood begins. 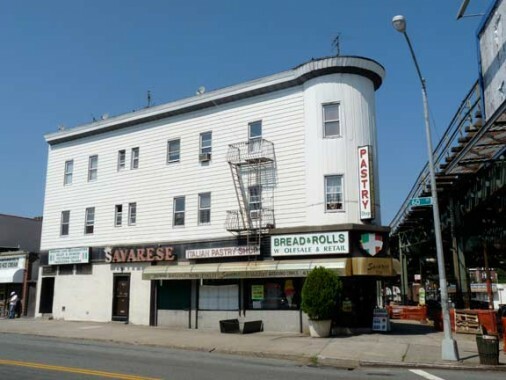 Bensonhurst features many quality Italian pastry shops and one of these is Savarese, at 60th street. I got a sour Italian ice, but it took great willpower to not purchase more Italian pastries and baked treats, which fill display cases and wall shelves. 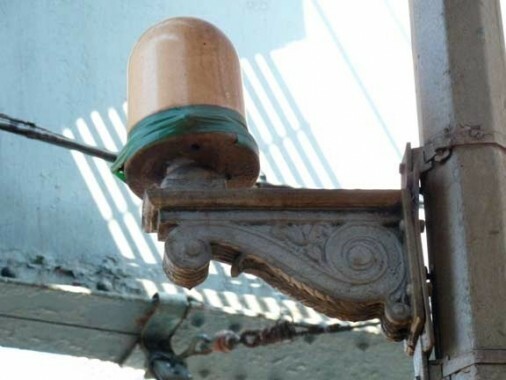 At 60th Street under the el is an early 1910s-style fire alarm stanchion. The accompanying fire alarm lamp is unusual, as well. This curving mast usually appears on ornate cast iron Corvington or Bishop Crook lamps, but this one was co-opted for an octagonal pole. 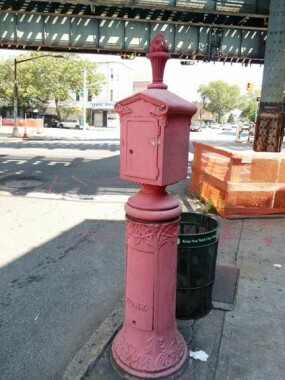 Quite unusual– only two other examples of this can be found in Brooklyn, both on Avenue L in Canarsie. 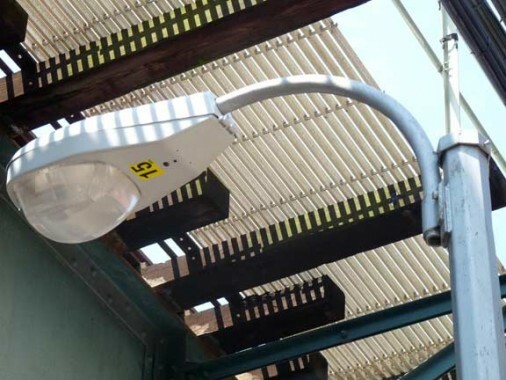 Its days may be numbered, as new fire alarm lighting has been installed on lamps throughout the city. Underworld Plaza, at 61st and New Utrecht, isn’t a lounge or disco but a wholesale lingerie distributor. Though it might make sense to combine operations. Time to kick it in the head for today at what used to be Bath Junction, at 14th Avenue and 62nd Street, where the steam-era West End and Sea Beach railroads met. Today the West End el runs atop the Sea Beach, which runs in a tunnel. The bus plaza was once a trolley lines terminal, and a couple of trolley poles remain. 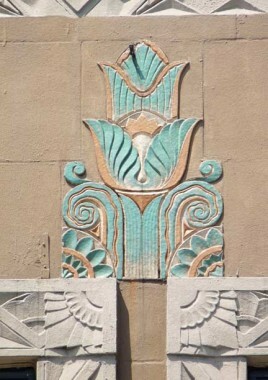 The Vickers terra cotta tiles here are especially varied and bright. Photographed August 2011, page completed 10/23/11. my place was 38st park on 15 avenue ( park boys) from 1963- 19 70 and allso 50st forthamilton grad from Lafayette . 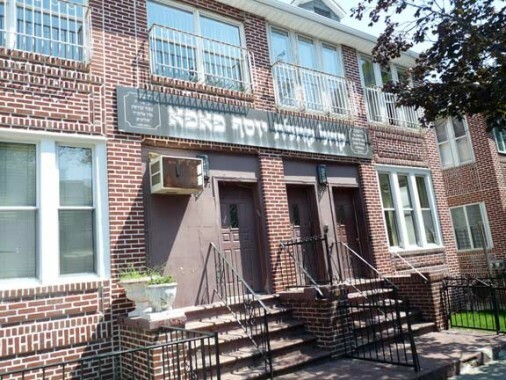 For some fantatic architecture, check out 1363 50th Street in Borough Park, which houses the Ateres Golda catering hall and Bnos Zion b’Bobov school for girls. The gigantic building is a former Masonic Lodge, and there are plenty of masonic symbols on the facade that the Bobov hasidim did not cover up. 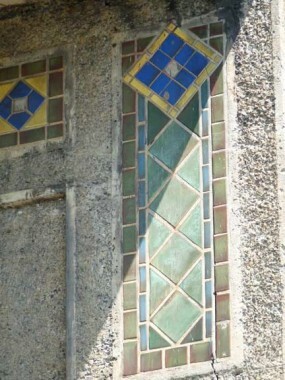 The 14th Avenue wall features the masons’ trademark triangle ruler. 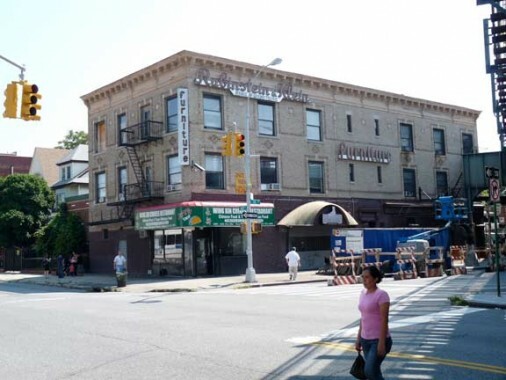 At one time there was a small Italian-American enclave around 13th Avenue & 39th Street. An Italian pastry shop (name I’ve forgotten) was on 13th Avenue in that little section. 13th and 14th Avenue from 37th to 60th Streets were converted to one-way streets in 1989. Scotto’s is the name of the bakery…. they’re still there…..
there was also another bakery on the corner of 38th-same block as Scotto’s I think, called Carini, I bought all my kids birthday cakes there. You had Scotto’s on 13th Avenue between 38th St. & 39th St.; Carini’s was on the corner of 13th Avenue @ 38th Street. 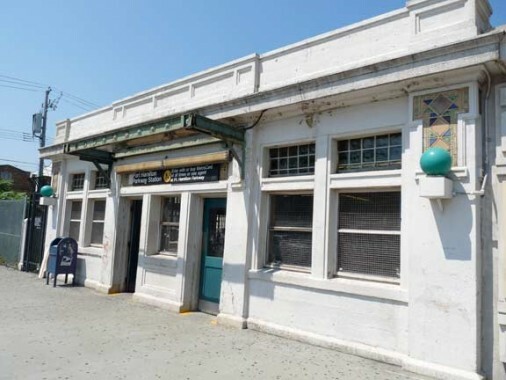 Don’t forget, Red’s Pizzeria & Italian Restaurant across the street on 13th Avenue between 37th St, and 38th St., just off of the Culver Shuttle Elevated train tracks. 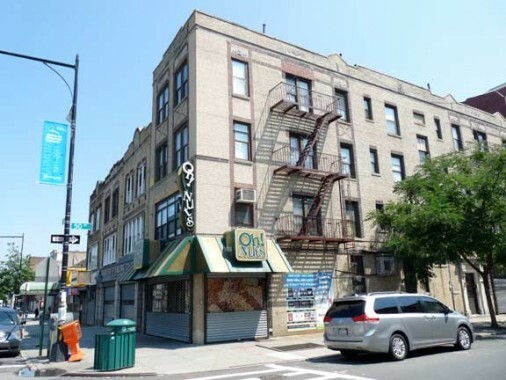 Then, Gino’s Pizza on what, 13th Avenue between 40th & 41 st; Lenny’s on 13th Ave @ 42 St; Vinny’s Pizza on Ft. Hamilton Pkwy @43 St, and moved across the street on the parkway between 42 st & 43 St; DePallo’s on Ft. Hamilton @ 40th St across from the funeral home, next door to Basil’s Grocery… What was the name of that place? Oh, BRIZZI. Joseph A. Brizzi & Sons. Also, next to DePallo’s, was Benanti Grocery with Pete & Margret. I grew up with their son Joe. Then on the “Street” (40th) between 10th & Ft. Ham, you had everyone that I could list going back many years and take up all the space here. The sign is in Hebrew. The building is used by the Pupa Hasidim. The building on 53rd St. I think St. Michaels on 4th Avenue has always been taller than St. Catherines. Shalom Kevin, for a goy you do a good job keeping the kosher and Irish separate. Loved this post. I was a Queens kid and never knew this area existed. Directly across the street from Brizzi Playground was a triangle-shaped street (I guess it would be called a “square” but it was definitely a triangle.) That was our slap ball and “kick the can” playground. 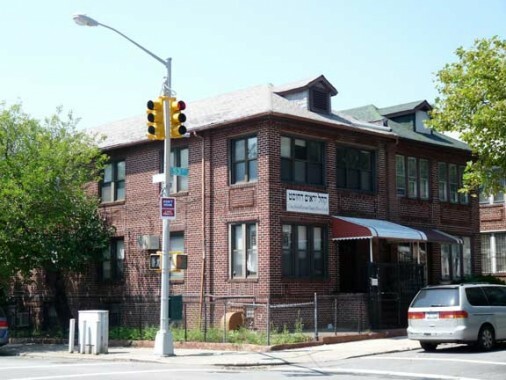 In an earlier photo, you showed “The Borough Park Club” at the corner of 13th Avenue and 50th Street, which became Yeshiva Etz Chaim. That was my elementary school. Our most famous graduate of that school is the noted attorney, professor and Constitutional Law scholar, Alan Dershowitz, who is also a Borough Park boy. I lived close enough to the bell tower of St. Catherines, on 40th Street and Fort Hamilton Parkway, to hear the bells every Sunday. I can STILL hear those bells (I’m only 2000 miles away) and can replicate the chiming pattern. did you live at 970 42 street across from the playground and above the candy store and mens club? 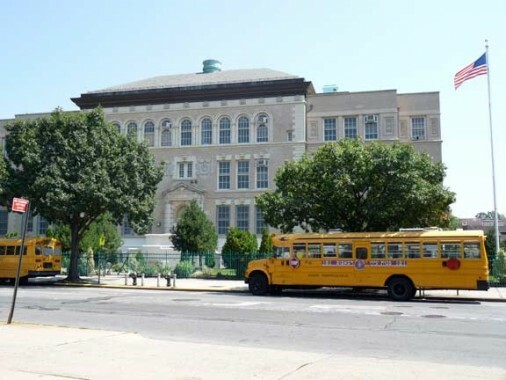 i lived there from 1955-1963 went to ps 131 and loved burgerama. I lived at 959 42nd, across the street from you and about 1/3 of the way up the block, toward 9th avenue. The 42nd street side of your building is where we drew our “strike zone” for stickball. 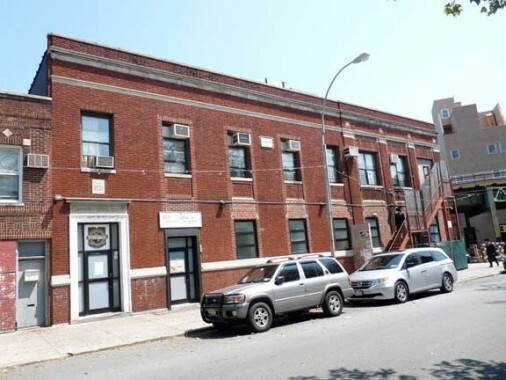 Across the street from you, in the building with the laundromat, was our punchball court. The entrance to the apartment building was first base, the pole with the alternate side of the street parking sign was second base, the fire hydrant directly opposite the building entrance was third base and the big red fire alarm box on the corner was home plate. Diagonally across the street from you (and across from the park) was the triangle formed by 42nd street, 10th Avenue and New Utrecht. That was our slap ball and kick the can court. I broke a window in your building while playing stickball. I hit a foul ball which went straight up and broke a window on the 3rd floor (I think). I offerred to pay for it but the nice lady who lived there refused payment. That may have been my last stickball game. I can’t believe that a rubber Spalding ball could break a window, especially on a high, lazy foul ball. We used to go into the candy store all of the time. That’s where I would buy Spaldings (“Spal-deens”), or their competitor, Pennsy Pinky. 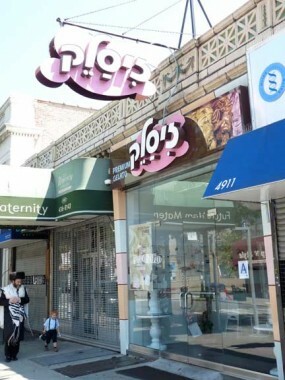 That’s probably the first place where I tasted an egg cream. Cokes were six cents. 42nd street was great. We would all go down to the street and play ball until the sun went down and it was too dark to play. These days, in “the suburbs,” nobody plays on the street anymore and kids don’t know the other kids who may be right across the street. Sometimes, “progress” is not progress. possibly you hit that ball through my window. Your name is not lenny is it? Did you know the piccones? do u remember the loews theater and somthing with a d another theater, they were beautiful with a beautiful water fountain that you drank out of. Hi Debbie,do you by any chance have a photo of Burgerama or know of anyone that does?I’d love to have a look at it again and have never been able to find one online. Yes those nuns knew how to handle a large class and get the subjects taught. Since you are younger than I am, you had smaller classes. I attended St Emeric in Manhattan (corner of E12th and Ave D – building still there but no longer a school). We had 50 students in a class. Classes got smaller over the years. The building had one classroom for each grade. 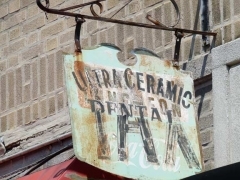 i’m SO glad you refer back to old posts–i always got a huge laugh out of one & you chose it today–in recalling the beauty parlor, you said something like “only in forgotten ny do we turn on a dime from talking about elevateds to beauty parlor nomenclature”!!! 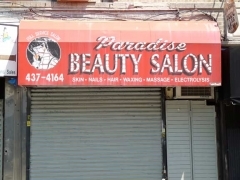 The beauty salon on 40st.&10th ave. closed about 20 years ago(give or take a few).It was run by a Mrs. Fantuzzi. 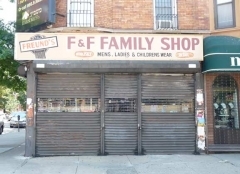 (I forgot her first name).She retired and closed shop and continued to live above the shop until she passed awayseveral years later.Mr.Fantuzzi lived in the building until about 5 or 6 years ago. He either passed or moved away,I dont know which. Now, that’s incredible that it remains frozen as was for 20 years. Unnoticed by anyone but me. That’s what FNY is all about. The beauty salon owner’s first name was Elizabeth. Before it became a beauty Salon it was a Funeral home run by the Genarellis (circa 1930s) the funeral home moved to 41 street and new 10th ave under the “EL” where is stayed for some 30 to 40 odd years… Elizabeth’s son’s use to play a game we never saw before in mid 1960s Brooklyn called Soccer. We would stop our street hockey game to watch them wondering what they were doing. 40th St @ 10th Ave, is where the “Naps” lived. 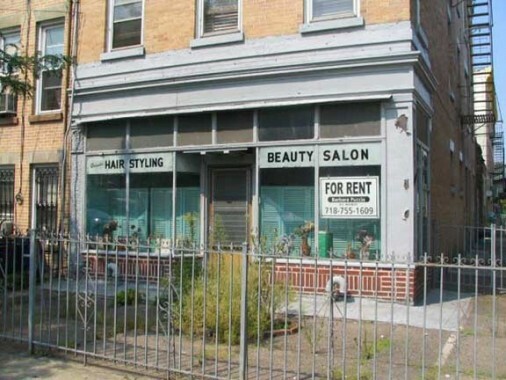 Babo (Clement) Napolitano, the corner of the beauty parlor was Carmine Genarelli’s funeral Home. 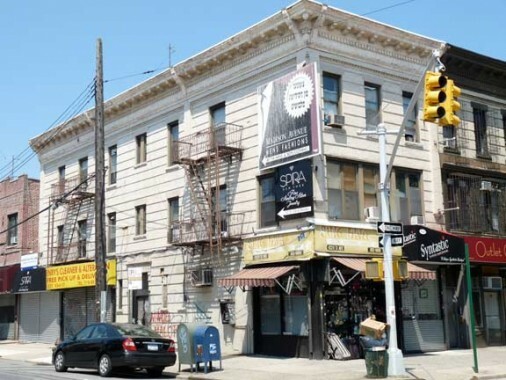 On 39th St between 10th & Ft. Ham, you had Salerno Funeral Home, now converted to apartments. Brizzi livery garage where the old horse stable was. 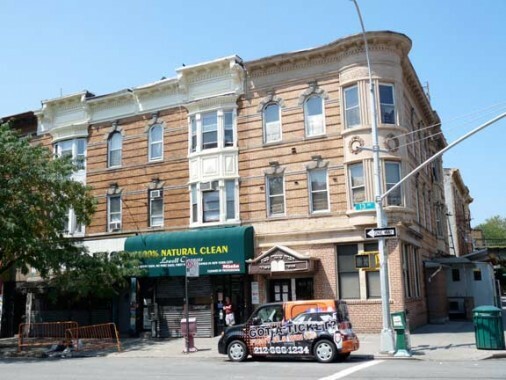 On 12th Avenue between 40th St & 41 St, my first cousins, Frunzi had a funeral home. First was 40 ST @ 10 Ave; then 41 St @ New Utrecht Ave; next Ft.Hamilton Pkwy @ 43 St.
Joanne Brizzi was in my class at St. Catharine’s- 1961. How is she related? Help me out– I was in Joanne and Lillian’s class at St. Catherine’s ( 1961). I remember your name but can’t quite place you in the neighborhood. I think you were in my brother’s class. Where did you live? My older brothers are Andre (class of 1954) and Gandy ( class of 1956). 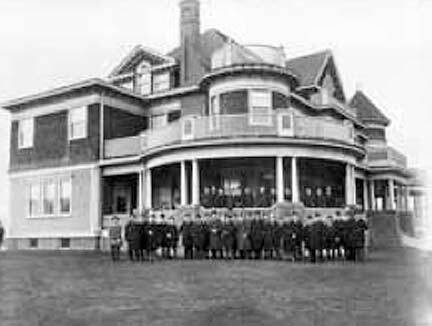 A couple of my cousins also went to St. Catherine’s– Annette and Gary Di Maria; Peter and Joanne Marsala; Joe, and Dolf Ferucci. I do remember Maurice who I think was about the age of my brother Andre. My cousin Annette at one time owned the candy store at 10th & 42nd Street ( Maurice and his family members were prominent at that location). Amazingly, her husband Tony’s family owned the candy store across from St. Catherine’s at 41st and Fort Hamilton Parkway. Correction Brizzi never had a livery garage. My Dad was from 11th Avenue and 49th Street. He and his friends created the Ty Cobbs. They also did roller hockey down on Fort Hamilton Avenue. My Dad, skinny as he was, was the Goalie. My mom used to work at Savarese when she was young.She lived in the house behind it on 60th Street and she met my dad who lived on New Utrect,under the el a few stores down. I remember taking long walks as a kid so I can go to savarese’s bakery fro some ices in the summer. Now I travel 3000 miles to get some cannoli and rum babbas there. I make it a point to stop at Savarese’s every time I’m in New York. I lived on 52nd street and Fort Hamilton Pkwy when I was very young.I love this very nostalgic and informative site. I lived on 49th street between 14th and 15th ave. This was a great look back in term of nostalgia and historic preservation my two main fields. Loved it and thanks. Thank you so much for this wonderful trip down memory lane. I left Boro Park when I was 18 and my parents were moving to Dallas. Have such good memories of that time and so glad thaqt you shared all those wonderful pictures and descriptions with us. I lived on Ft Hamilton Parkway between 37th and 38th st. It was originally my grandparents home, then my parents and finally belonged to my family. It took me 50 years to leave but my heart is still there. My oldest son always regrets not buying the house. Seeing these pictures and stories brought back so many wonderful memories. Thank you so much. You must be Geri Erichetti. No, I loved that Jeep, my husband’s sister’s nephew bought it, many years ago. He told us he was stopped by the cops, they wanted to know why he had my truck. That was a one of a kind. Yes, it’s me. How are you. I am alive and well living in Ridgewood, NJ. My family moved to Staten Island in 1966 and I moved back to Brooklyn in 1970. I have been in NJ since 1972. We last spoke at the St. Catharine’s 25th get-together in 1986– time just flies. Sue and I have five kids between us and nine grandkids. Where are you these days? Any news on the folks we grew up with? Your Jeep must have really been something to elicit the reactions of others. Do you still have the blue Jeep Cherokee?? I lived on 50th St. near 16th Ave. through the 50s and most of the 60s, attending the Hebrew Institute of Boro Park on 50th St. and 13th Ave. This article brought back many memories and, more, introduced me to architectural gems I never noticed as a child. Thanks. As I scrolled through the article I was hoping to see a photo of my old school but, alas, there is none. Do you — or anyone who might be reading this — have a photo of HIBP or know where I can find one? The Boro Park Historical Society doesn’t seem to have a website. Help! Can’t remember the name of an ice cream parlor on new utrecht avenue and 57th or 58th street. Think it starts with the letter z. That was Lazerase. I used to attend St Frances De Chantal elem school and go there for lunch. I lived on 58th St and 14th Ave from 1956 to 1974. My name is Frank. I lived at 1535 58 the street. Do you remember the dances sponsored by the Squire Club. There was a Knights of Columbus meeting hall across the street from Lazerase Ice cream Parlor. In the late 1960’s they (K of C) sponsored a boys club called the Squires, which I was was a member. Mr. and Mrs. Lazerase were wonderful sponsors of the boys club. I loved their Ice Cream Parlor. It was a classic. Now that I live in Los Angeles CA., I recently went to the LA’s Magic Castle which brought back stronger memories of their establishment. Jane I imagine that we knew people in common since we were aprox the same age. 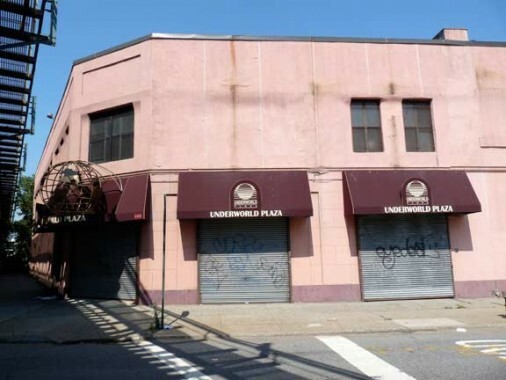 The building called Underworld Plaza on the corner of 62nd street and New Utrecht avenue used to be the Nabisco factory when I was a baby until about 1982. I lived on 16th ave and 41 st stret in the 1950s. Does any one remember the yavneh synagogue on dahill between 40th and 41st st. Looking for people from 41st street and 16th ave 1630 41st street. Any one from 4217 16th ave accross from the jr high school. 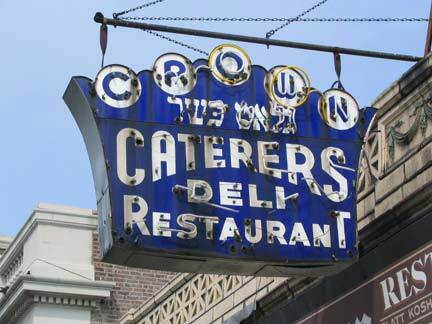 I sure do.Had my Bar-Mitzvah there in 1955. Rabbi Shapiro. Remember how I was afraid the floor in the Shul was about to collapse. 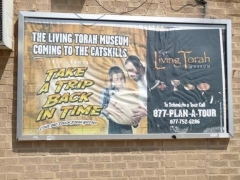 My son had his Bar Mitzvah there also. I grew up on the apartment build on the corner of Dahill and 43rd. Went to Etz Chaim on 13th Avenue. Does anyone remember a bank on the corner of 3rd Ave and 39th St. It had a steep red, pyramid tower roof. It was a brick building right on the corner. i lived on 38st between Ft. Hamilton and 12th. ave.
anyone remember Frankie/Lenny/Joey Pasqualie ? anyone at St. Catherines in early 50’s? I remember the Pasquale boys. A very sad sorry ultimately. The drug thing got them in the early 60’s. My brothers (Andre and Gandy) , cousins Annette& Gary Di Maria and Peter and Joanne Marsala among others went to St Catharines. Now I remember. We lived at 966. Billy Alena– also known as Billy Bumper— big guy. Can’t say I recall The Torches or the The Wanderers. My dad was Joe Pagnello he died January 2017 he had great memories of that area. I remember Donnie’s car, too. My brother Andy is well and now in California. I believe Billy Panzella lived in Staten Island and was the amateur baseball league czar at one point. What great memories you bring back. Born in Marine Park, Brooklyn in 1949, and moved to Woodside, Queens in 1954, Most Precious Blood School then Mater Christi HS both in Astoria. One other reason Catholic schools are disappearing, is that since the late 60’s the numbers of teaching sisters has seriously declined. Thus schools must hire lay teachers and pay higher salaries….thousands more than the nuns were paid. Hence tuition soared, Catholics used to have large families, and always sent one or two children to the priesthood or sisterhood. Hi to everyone who lived in boro park.. What a great trip down memory lane I grew up on 42nd. street and 10th. ave. I also lived at 970 42nd. st. 4th. floor who remembers our super mr. and mrs. Jackson. Deb. I do remember the picons. roberta, ralph, and pauline.. does anyone remember Carolann fratina and her family she to lived in 970 and the Brodskys they lived in 958 2 doors up then theres Barbara magavaro, the twins alona and Betty the list goes on, and on my friends. Yes we did own the streets we played on them from morning till night sat and ran all over the park. we were always busy roller skating, bike riding playing ball what an era and we did do overs and never asked why we played far.. I hope some of you remember me Maria soooo I will see you at memory lane my friends till then remember this we had the best of the best! By for now…. I lived at 966 42 St. The Picones lived across the hall from us on the second floor. Ralph was always saying “faugetaboutit” before anyone else had heard it. The Brodskys ( Bernice , Sam, Butchie, Cookie)were neighbors of my aunt ( the Ferucci family) in 958. Sara Brodsky (known as Cookie) was named for my aunt. In 970, there was my uncle Benny Di Maria, aunt Connie, Gary, Annette and Denise.Thanks for mentioning the twins names. I have been banging my head against the wall for years trying to remember Alona. 970 also had the Rizzo’s ( Jeanne Rizzo married my cousin GARY) Manno’s and Piazza’s, and I remember the Jackson’s. How about ” Little Josie” and her daughters Rosalie and Andrea? Many more memories to share later. omg he knew all the bookies in the neighborhood and my dad used to bet horses with him. They were great friends. Pauline was besties with my mom..Did u remember their beautiful daughter Roberta? Did you remember the cohens from that building, and aunt and grandmother and their daughter Janie who used to come to visit? I have been laughing my head off about your memories of Ralph saying, “HEAVY”. My Dad thought that was hilarious and simply personified Ralph– brash, loud and mysterious. What a bunch of characters. I certainly hope Roberta is alive and well since she was a year or two younger than me. As a young girl of 5 or 6, she used to enjoy sitting on the fire escape of her apartment at the rear of 966 and saying, “BINGO” for no particular reason to the boys playing in the backyard. It sounds somewhat like Ralph’s, ” HEAVY”. I too went back to 42nd Street a few years ago before the buildings were rebuilt. They were all abandoned and burned-out shells. The beautiful lobby of 970 was totally trashed– in fact, an wrecked car had been driven into the lobby past the mail boxes. Just shocking. Remember sitting in the lobby on hot summer days since the tile floors and walls stayed cool– in the snowy winter, we would go in the lobby to warm up on the radiators and to dry our wet gloves and clothes. Same thing in 966. On that visit, 966 was just a disaster. I waded through the debris and I went inside my old apartments in 966. We (my parents and two older brothers) lived in two bedroom 4A on the first floor until 1959. Then we moved upstairs to the second floor three bedroom “palace” at 1B and stayed until 1966. I was struck going back to the old homestead by how small everything was. The kitchen was tiny, the bathroom was claustrophobic and how did I share a room with one or two older brothers. Debbie, you mentioned your Dad playing the ponies with Ralph. What were your parent’s names and your last name? I was trying to recall Barry Silberstein’s father’s name. Henry?? Share some more when you can. Where are you living? I am in Ridgewood, NJ. Sue and I have five kids between us and nine grandchildren– number 10 coming in the summer. So sad to see the building now, almost depressing. I guess I needed to go back to feel a sense of yesterday and innocence. And remember my parents and the life there. Didn’t feel what I thought I would, I left empty and disappointed. I also rememeber the bakery and drug store across from the park. Ps 131 was horrible didn’t have great memories about that. we lived on the 3rd floor walk up, my bedroom faced the back of the building. we all lived in a one bedroom, and my parents slept on the couch that opened in the living room. just saw your post, yes the brodskys were my parents friends. Nat Brodsky was literally my dad’ best friend. His name was Irving, my mom Esther. They both passed. Do you remember Lenny? I went back to 970 42 street today. first time back in years. everything inside was different. there was an elevator now. buzzer system, security person. floor was now brown, not black and white. no stairs. it was depressing, I was looking for the old memories. say, why did Lennys Pizza on 13th and 42nd close up when he did? Ginos is still there. What happened to the guy selling bananas off a table also on 42nd and 13th? Thank you for such memories. My father was from 11th Avenue and 49th Street. 4907 to be exact. Every day my Grammy, after her 3rd retirement, used to walk to 13th Avenue. In fact, I used to walk with her all the way to Alba’s Bakery, even though Piccolo’s delivered. Those marvelous days are now gone. My Dad was one of a few that formed the Ty Cobbs, in fact it was his handwriting on the back of the jackets. My Grammy was one of the last hold outs in the neighborhood. Such a loss. God Bless the old days. Back in my Dad’s day, what a great place to be a kid!!! I forgot to mention. My parents were married at St. Catherine’s in November,1955. He went to St. Catherine’s elementary because he had “disciplinary” problems. I guess the nuns straightened that issue out. Then, he went to Fort Hamilton HS and graduated in 1951. 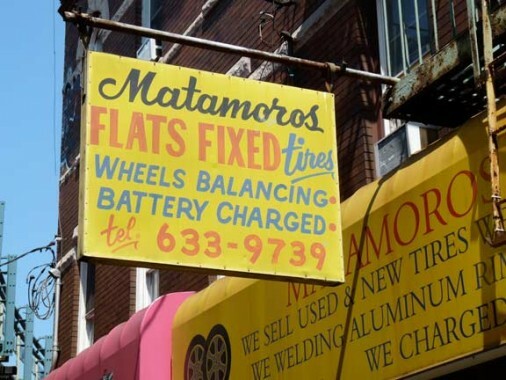 My dad was an optometrist on 45 th st between Ft hamilton and New Utrect ave. He died in 1965. his name was Dr Bernath Friedlander. Anybody remember him? I remember your Dad’s office. He had a wonderful item in the window ( the exact name of the device escapes me now) which rotated as the sun hit it. It was a tiny pinwheel in a glass case– the four panels were black on one side and white on the other and the color difference made the pinwheel turn. I was always fascinated as a boy. Next door on the corner of New Utrecht was a shoe repair shop that also specialized in cleaning and blocking hats. Certainly a lost art. My parent’s first apartment as newlyweds in 1937 was on 45th between 10th and FH Parkway. They moved to 42nd between 9th and 10th in 1943 where I grew up and stayed until December,1966. Thank you so much for sharing your memory of my dad’s office. Remarkable that you recall with such detail the pinwheel in the glass. I think that is where my Grammy got her glasses. She lived on 11th Avenue and 49th Street. Her name was Mary Suplina (Supljna) Stefanich. Thank you for this! I lived on 47th between 9th and 10th. Every picture is so familiar and stirs so many beautiful memories. Again, thank you! 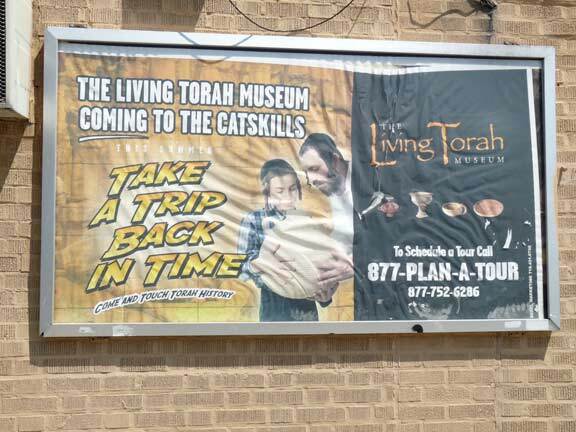 Thanks for the memory trip, I lived on the corner of east 2nd St and Cortelyou Rd but Boro Park was where I actually existed. 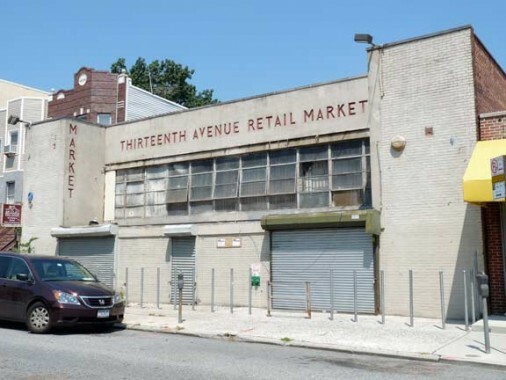 The Market on 13th ave was where mom shopped and I suffered attending Etz Chaim for eight very long years.. 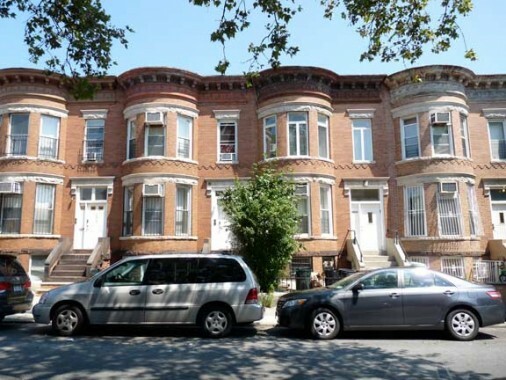 Moved to 66th and 16th Ave but went to Erasmus and later Brooklyn College. Where has the time gone???? Interesting that you mentioned the noise of the West End train. 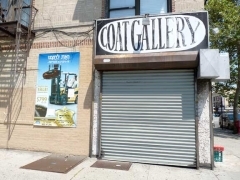 Does anyone recall that there used to be a bowling alley, under the EL, on New Utrecht, between 46th and 47th, or maybe it was 47th an 48th Streets? The first televised bowling show I ever saw was from that bowling alley. Every time the train would go past, they had to cut the sound. If trains were going by in opposite directions, it might be a full minute of silence, with only the pictures of the bowling ball silently knocking down the pins. Surreal. In response to Marvin Chadab (whose post is right above this one), I went to Etz Chaim and graduated in ’64. I then went to Yeshiva of Flatbush High School, Brooklyn College and Brooklyn Law School. I now live in a suburb of Dallas. A) My in-laws, who live in Fort Worth, have friends they’ve known for many years, who live in Houston. Murray, the person they know in Houston, also went to Etz Chaim. I think he graduated in the early ’50s. B) The retired chairman of the school board at my synagogue in Dallas is Fred Nathan. He’s from Boro Park. His mother was the secretary at Yeshiva Etz Chaim. Everyone remembers Mrs. Twersky, who was the other secretary and was always running through the building with something important (to her) to do but I don’t believe many people remember Mrs. Nathan. She was the quite one. Hey Jake, I also grew up in the area (around the mid-70’s to early 80’s) and I remember G&Son’s and also the Fat brothers store, I think they used to have some arcade games outside their stores and I specifically remember spending money on a Star Castle game that I enjoyed playing. I also blew my allowance buying Reggie bars and baseball cards. There was also a pizza place along that same side of the street and I remember when pizza there was 50 cents a slice (!) and the subway fare was also a 50 cents flat fare throughout the city – I’m feeling really old right now. My friends and I used to play handball against the wall of the post office building on the corner of 51st St and 12th Ave – in the street (can’t do that these days). 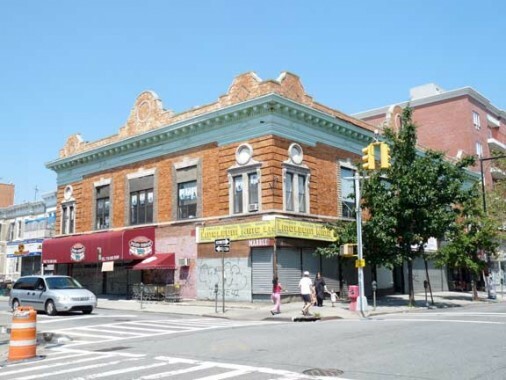 As I’m typing this, memories of Walbaums grocery store, the Borough Park library, all the shopping along 13th Ave are flooding back to me. I still think the bagels I used to get along the bagel shops on 13th Ave were the best I’ve ever had – don’t know if any are still there. Does anyone remember Bella Pizza on 62nd St off 11th ave. They only opened on Sat. & Sun. Also, any St. Frances de Chantal alumni out there. Hi I graduated from St. Frances in 1967. I lived on 57th street till 1978 when I moved to Staten Island. My grandfather bought our house in 1924 and my family sold it and moved in 2012. I remember bella pizza in my opinion it was the best Sicilian pie I ever tasted..i rememberthe red coca cola box for ice cold soda..
Hey man I went to Saint Francis on 57st. Been first there for release instructions 1966-1971 on Wed.afternoons from PS 103 on 54st 14ave. Then went to PS 160 on ft. Ham. in 1970 and then back to Saint Francis for 7th & *8th grade. Been hit with keys on my head by Sister Margaret Mary, and slapped by the nuns from Sister Francis Rita with ruler for Math class and slapped and almost punched by the worst of all Sister Mary Ann Miller. Some believe she was an ex boxer before. What good times to remember. 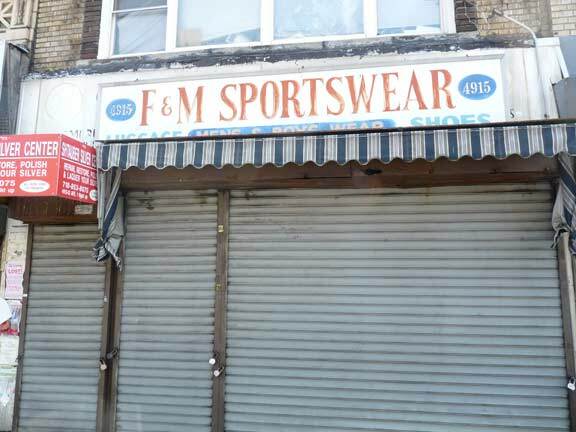 I am from 54st boys later bath ave in the 70s then w12stAve U 80s spamoni gardens L&B pizza. Doyou remember the Disco on 53st.betw new utrect and 13ave around 1976-1978. We escorted Double Exposure radio hit “10 percent” to a place to eat, as they were the only black guys in the neigborhood. We walked with them to our favorite hangout ;where else Millers restaurant 56st New Utrect. 54st.-55st new utrect &13ave. Yes the boys and girls who created noise until 3am with fighting,music and having a bite to eat at millers. Yes indeed fun times growing up in the 60s, flipping baseball cards,paying kings,stickball,off the point,triangle,jumpin rope with the girls,heading over to polios on 58st. Having big nelson after downing 20 godfathers,15 black russians,16 white russsians,half the bowl of spiked punch and smoking 4-5js then destroy the flamingo club on new utrect and 57 or 58st cant remember. it looked like a movie. great memories. i survived and straightened out so people say, living now Jersey. Hey man I went to Saint Francis on 57st. Been first there for release instructions 1966-1971 on Wed.afternoons from PS 103,then to PS 160 in 1970 and then to Saint Francis for 7th & *8th grade. Been hit with keys on my head by nuns Sister Margaret Mary, and slapped by Sister Francis Rita with ruler for Math class and slapped and almost punched by the worst of all Sister Mary Ann Miller. Some believe she was an ex boxer before. What good times to remember. I am from 54st boys later bath ave Brooklyn czars italian in the 70s then w12st Ave U spamoni gardens L&B pizza. Do you remember the disco ‘Grden of Eden” on 53st.betw new utrect and 13ave around 1976-1978. We escorted Double Exposure had hit “10 percent” to a place to eat, as they were the only black guys in the neigborhood. our boys walked with them to our favorite hangout ;where else Millers restaurant 56st New Utrect. 54st.-55st new utrect &13ave. Yes the boys and girls who created noise until 3am with the fighting,music,girls dancing and having a bite at millers. Yes indeed fun times growing up in the 60s. We flipped baseball cards,played kings,stickball,off the point,triangle,jumpin rope with the girls,heading over to polios on 58st or walking to lennys pizza on 13ave at night. Having big nelson after downing 20 godfathers,15 black russians,16 white russsians,half the bowl of spiked punch and smoking 4-5js then destroy the flamingo club on new utrect and 57or 58st cant remember. it looked like a movie. great memories. i survived and straightened out so people say, living now in jersey shore. Lived in tulsa,chicago,los angeles,w.hollywood,hollywood,van nuys,las vegas andreturned to the shore. The old neigborhood changed,even the house i grew up in was gone,st francis gone,my high school pill hill gone(retarded school for slow people),my 3rd college CEI las vegas gone. I dont know why. Some of my buddies all past away,most of them became cops, or in jail. My bath ave buddies also gone. bay 10th bath ave 1970s, liquor store hangout. pool hall 86st 18ave. Still dont look my age. The story concentrates too much on the fringe areas of Borough Park, namely the high30’s-low 40’s near Ft. Hamilton Parkway and emphasizes the Italian pockets on the fringes of the area. 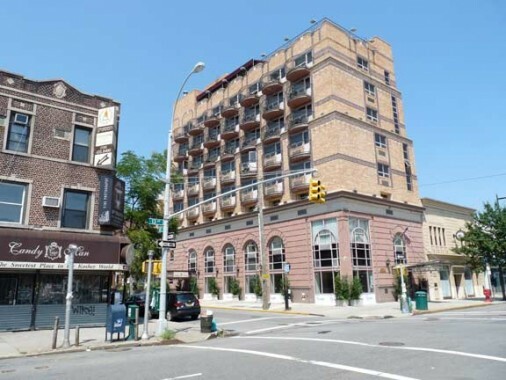 The writer should have concentrated more on the traditional Jewish “heart” of Borough Park in the mid to hi 40’s to mid 50’s streets between 18th and 13th avenue and shown photographs of many of the beautiful private homes and apartment buildings that existed at that time, namely the 1950’s and 1960’s before the area was overrun by the various Hasidic sects and most of the secular Jews started to move out, a process basically completed by the 1990’s. And it was a wonderful area to grow up in, clean and safe and family-oriented. I agree very much with this comment. 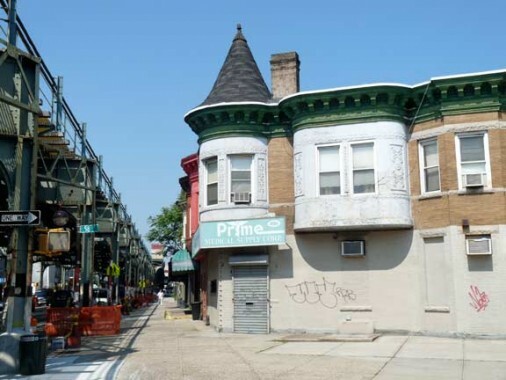 I spent the first 21 years of my life in Borough Park and most of the sites and references are unfamiliar. More info. on the heart of the neighborhood you refer to would very much fill out the picture. I graduated from St. Frances in 1967. My grandfather bought our house on 57th street in 1924. 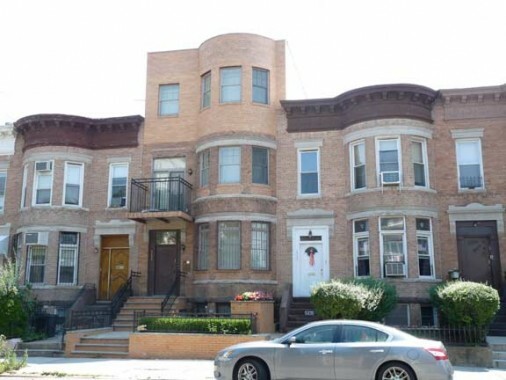 I moved to Staten Island in 1978 but my family remained on 57th street till 2012 when we sold our house. Sorry, I don’t, do you remember Meyers Luncheonette by any chance? The luncheonette at 41st& FH Parkway was indeed named “Tony’s”. The Grillo family lived upstairs over Tony’s and the Grillo kids went to St. Catharine’s. Tony Di Pietro ran the place and his son, Tony, now in his mid-sixties is married to my cousin Annette (nee Di Maria) who lived at 970 42nd Street. They live in Florida now. 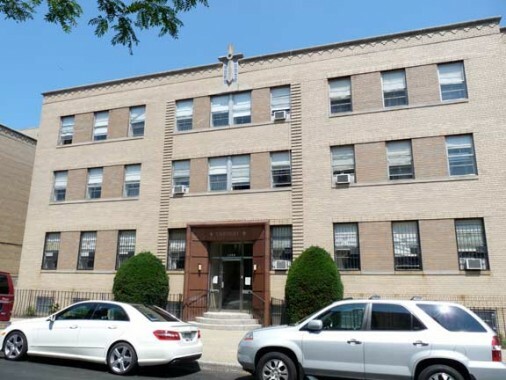 I lived at 966 42nd Street and graduated from St. C’s in 1961. I knew a Charlie Buckley who lived on 42nd Street between 8th and 9th. Would that be you?? That would be me. I don’t often come to this sight but as they say “better late than never.” Hope all is well with you. As I recall we both went to Brooklyn Tech. Wow!! What a guess that it was you. I am well and living in Ridgewood, NJ. Speaking of TECH, it is our 50th anniversary since graduating- where do the years go? We plan to attend Homecoming in April since our class is being honored. I went back to TECH in 1990 for the 25th. It is just amazing to go back and see so many things haven’t changed. Lots of modern technology of course but the hallways, auditorium, lobbies, , etc. 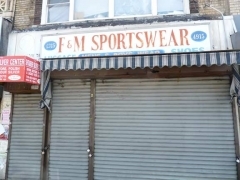 are in great shape but the same as when it opened in the 1930’s and when we were there. If you can, I would suggest going back in April– it’s just so rewarding. I live in Brooklyn (Dyker Heights). I have registered for the Tech Homecoming so hopefully I will see you there. Hi. Can anyone possibly have any information about Myers or Meyers Luncheonette, I think around the 1950/s or so? There was a Meyer’s Luncheonette on 18th Ave. My mother used to bring me there In the ’50’s for hand-scooped ice cream cones. I beleive that it was in the vicinity of 70th Street. I remember the Torches, although I wasn’t a member. A lot of Joes. Creamy/Joe Cerino, Shiv/Joe Manno, Swifty/ Joe Castagna, Joe Brizzi, Rocco Fiore, Joe Qualterri, Frankie Sacca. Lots of great memories. Graduated from St.Catherine in 1954 and St. Michaels in1958. Anyone remember Mario Miri, Tony Savoca, Mike Rapisarda, Alex Amadeo, Joe Pagnello, Sally Bull, Louie Cerino, Billy Panzella, Joe Alena, Donnie Alesi, Maurice Napoli, and his cousin Maurice, Jerry Fasolino, Benny DiPietro, Sonny Milo, Robbie Crudo, Johnnie “Psycho” Cavallo….I could go on and on. I’m alive and well and living in paradise in Manhattan Beach, California. hi andy are you andre, gandolphs brother swifty is my brother and joe ceamy gualtieri is my cousin who I just got in touch with after forty years. iwent out with johnny pyscos sister way back when, we had some great times back then. please reply vinny castagna . I also lived on 54th Street between 13th and 14th Avenue from 1943 to 1953. I went to PS 103 and Shallow JHS. I remember playing stick ball with Buddy Hackett. The private house I lived in at 1336 54th Street was torn down and replaced with a multi-family home. 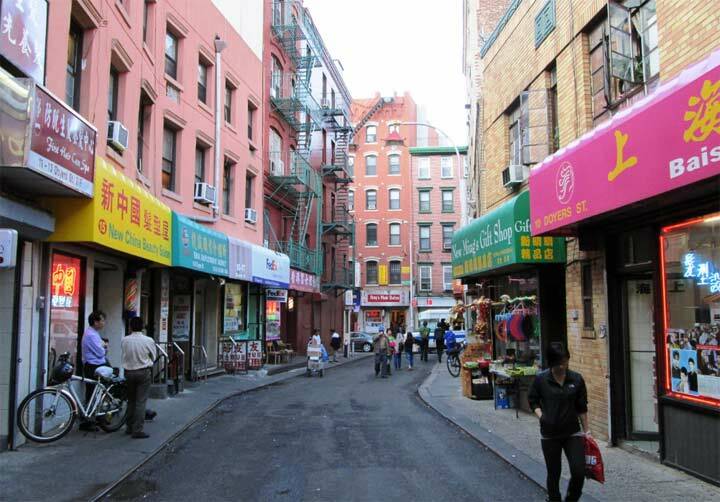 I remember the two candy stores around the corner under the subway. I lived on 47th street between 13th and 14th avenue in the old converted farmhouse. (1349) My father Louis Simms was the dentist. My mother Claire taught piano until she had a stroke in 1967. I lived across the street from the Bord Family. There were some gorgeous old houses on our street, and many small houses that were turned into shuls as more and more immigrants arrived from Eastern Europe after WWII. I remembr Ruby’s Candystore where we bought penny candies. So many memories. Does anyone remember my family? Many of my school friends lived on that street. We went to PS 164, Montaulk JHS and New Utrecht High School. Oops. I meant Fort Hamilton Parkway. Funny how time loses memory. My parents were married at Saint Catherine’s in November, 1955. My Dad grew up in Boro Park. My Mom was a “transplant” from Boston and had to be converted, to which she did out of respect for the family. Anyway, I remember Piccolo’s when we were desperate because they delivered. Alba’s did not. Alba’s was the BEST. 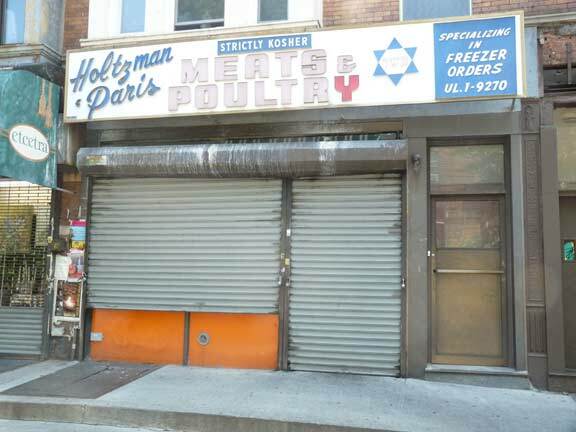 My grandmother lived in an apt next to the chicken slaughterhouse on 39th St. I remember hearing the chickens squawking as they were being killed. Also, in true Italian style, she also had beautiful tomato garden on the rooftop. Like the author, Dr. Levine on 49th St. was our family pediatrician and even a family doc for my dad. My grandparents ran Ruthie and Irving’s luncheonette and candy store on 13th and 52nd in the 50’s and early 60’s. Amazing pictures! Brings back memories for me. Lived on 39th and 12 ave. 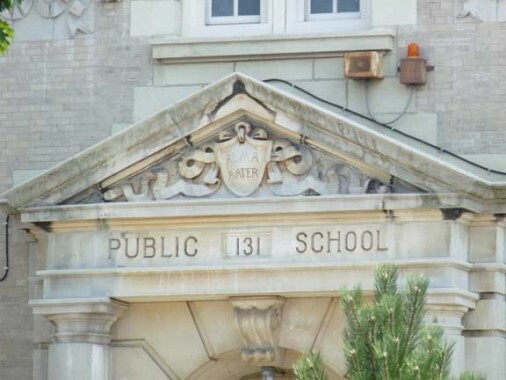 Went to p.s.131. Remember getting candy from Pearls candy store and pickles at the market on 13th ave.
My mom and dad (last name Basso) owned Joann’s Luncheonette on the corner of 39th and Ft. Hamilton Pkwy from the 50’s to 70’s. It was right behind Romano’s Liquor Store and across the street from Calabrese drug store (which we lived upstairs). 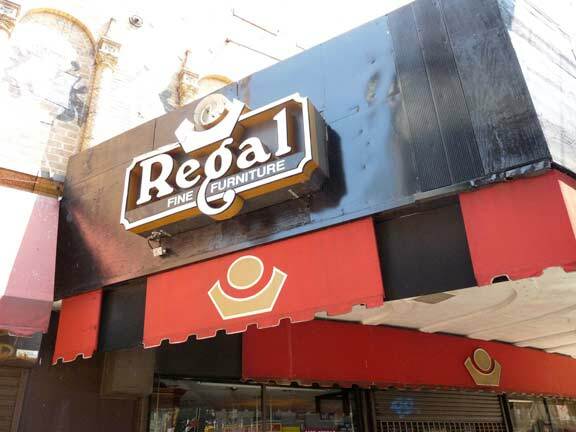 OMG, when someone mentioned buying candy at Pearl’s on 39th street (a tiny grocery store with great penny candies) red waxed lips, candy pack of cigarettes, shoe string cherry licorice sold by the string and so much more it took me back to a very happy place!! Loved growing up in Brooklyn. It was the greatest!! Don’t know if the OP still checks this thread years after it was started. Years ago (I’m now 75) my mother told me that my grandmother’s brother founded a synagogue at 49th Street and 14th Avenue. He probably arrived in this country from Galicia at the turn of the last century and his last name would have been Gottfried. I know nothing more about him but I’m working on my family tree and used Google Earth to check out the location. 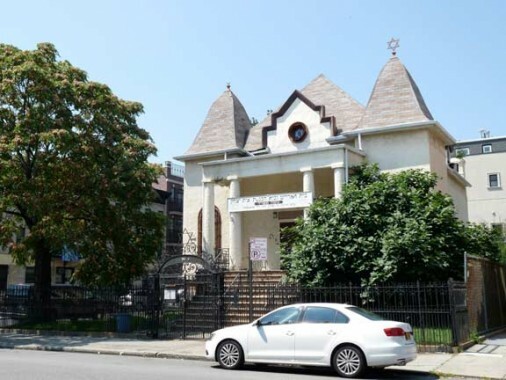 There’s no evidence of an old synagogue at that location, but the street view shows a Hasidic community. Maybe they demolished the synagogue. I came across this sight during my research and thought I’d post in case anyone has any information.